Angus knows he shouldn’t go to the Hunter Valley to check out a potential landscaping job with Lily. He has a wide range of tastes—including men and women—but he doesn’t stand a chance with Lily. Not only is she out of his league, she’s also crazy over Blake, the owner of the luxurious boutique hotel and winery they’re visiting. Sparks fly when Blake and Angus meet, and it’s soon clear the three of them could enjoy a debaucherous weekend. A couple of days of uninhibited fun is one thing, but Angus knows while Blake and Lily are suited for one another, he’s a tradesman who works in the dirt. He’s just visiting their opulent world. 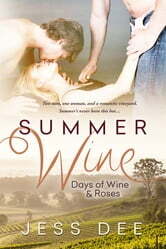 Each story in the Days of Wine and Roses Series is standalone story that can be enjoyed in any order.